As its name implies, a co-operative is about people coming together to meet a common need - be it economic, social, cultural, environmental - or all the above. It is a versatile business model that can operate in every sector of the economy, and in both urban and rural settings. When using the term "co-operative" we refer to both non-financial and financial co-operative organizations. A co-operative is a legally incorporated organization that is owned by its members, who use the co-operative's services or purchase their products. They can provide virtually every product or service and can be either for-profit or non-profit enterprises. Co-operatives are community-focused businesses that balance people, planet and profit. They are democratic and value-based by nature, and are formed to fill a void within a community, to seize local opportunities and to meet the needs of their member-owners. Whether the members are the customers, employees or residents, they have an equal say in what the business does and a share in the profits. Profits are distributed to members based on the amount of business they do with the co-operative. As such, co-operative businesses keep dollars circulating within the local economy, provide secure employment, and help revitalize, build and sustain healthy communities. Learn more by viewing our FactSheet on What is a Co-op? Learn more about financial co-operatives, or check out Cultivate.Coop - a great resource with films and videos about co-operatives from Canada, the US and around the globe! The key organizational difference between a co-operative and other corporate business enterprises is democratic participation through a "one-member, one-vote" process. In a traded company, shareholders are entitled to as many votes as they hold shares. Each member of a co-operative, however, is entitled to ONE vote, regardless of their level of investment. Consequently, no single member can take control of a co-operative, and decisions are made by and for the majority. Another key distinction is that corporations are mandated by law to provide shareholder value - i.e., the pursuit of profit - which means they must continually grow and/or cut costs to provide shareholder returns. Co-operatives are owned by their members, and while they provide value to their membership, their primary responsibility is to meet their members' needs. Members determine how the co-operative operates, elect the Board of Directors, and allocate the profits amongst its member-owners. A co-operative's business decisions are guided by a set of co-operative principles, which keeps their need for profitability balanced with the needs of their members and the well-being of their communities. As a result, co-ops tend to be a more sustainable business model with a high success rate - twice as many co-operatives remain in operation compared to other forms of business enterprise after 10 years! Compare the key differences between co-operatives and private businesses here! Learn about some highly innovative co-operative models. There are many different types of co-operatives operating in a variety of business sectors all over the world. The main categories of co-operatives include: consumer, producer or marketing, worker, multi-stakeholder, financial, and housing. 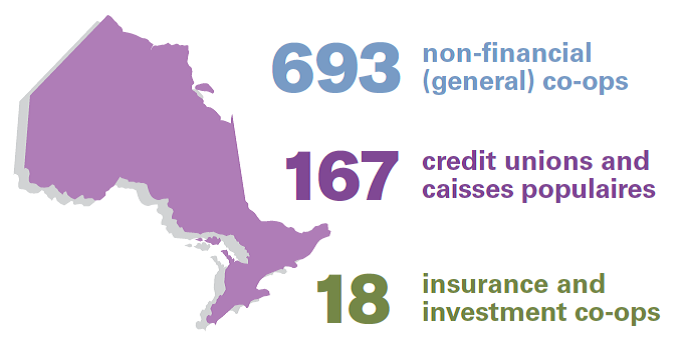 In Ontario, co-operatives can and do provide a diversity of products and services, including: agriculture, food and farm, tourism, art and culture, child care, housing, retail goods, renewable energy, transportation, social services, natural resources, financial and insurance services, and even funeral services! Co-operatives can be large businesses (e.g. The Co-operators, Gay Lea Foods Co-operative, GROWMARK, Inc., or Mountain Equipment Co-op), medium-sized operations (e.g., your local credit union or Ag Energy Co-operative, Hay Communications), or small organizations (e.g., Common Ground Co-operative, the West End Food Co-op, or the Aron Theatre Co-operative), to name a few. Check out profiles of some of our member organizations to learn more about some of the key co-operative business sectors in the province! View this short video that explains what a co-operative is.